What’s The Real Value of HPXML? Hint: It’s The People Behind the Standard. > HPXML News > What’s The Real Value of HPXML? Hint: It’s The People Behind the Standard. What's The Real Value of HPXML? Hint: It's The People Behind the Standard. The National Renewable Energy Laboratory (NREL) in Golden, Colorado is Transforming Energy from the way it is generated and used today to the systems that will power our world tomorrow. NREL is the only Department of Energy laboratory exclusively focused on energy efficiency and renewable energy. As such, NREL’s research programs advance the science of sustainable transportation, renewable power, and energy efficiency. The Residential Buildings Research Group within the Lab leads nationwide efforts in developing cutting-edge technical solutions to improve the energy efficiency of residential buildings. In our buildings research, we have been interested in pooling home energy audit data from a variety of sources for analysis of real-world savings and how they compare with modeled savings from energy retrofits. As we started to collect data for this research, it quickly became apparent that a hodgepodge of formats and data models was going to be a significant barrier in aggregating and making sense of the data. We found ourselves writing extract-transform-load code (ETL) over and over again instead of spending time doing analysis. I personally wrote a lot of that code as a junior engineer at the lab and wished there was a better way. Around this time, in 2011, I got involved with a working group that was creating the nascent Home Performance XML (HPXML) standard. Through countless conference calls, (sometimes) heated discussion, learning xml schema, and fiddling with iteration after iteration of the data standard, we came up with something we could all start using. Since then, HPXML has become an integral part of how we move residential buildings data around. It was used behind the scenes to do the analysis for several technical reports. We built an HPXML export into our BEopt software for use in the Building America program as a data archival and sharing format. That data is now available as a result of the federal government’s Open Data Policy via the Building America Data Portal. We have also been hard at work making HPXML able to cross pollinate between other DOE analysis tools and programs, such as a Home Energy Score importer and a SEED Platform importer/exporter. Adding HPXML functionality was never a trivial effort, but it has enabled us to connect data between systems in ways that we couldn’t have done otherwise. Moving forward, we are working on a consolidated residential energy modeling platform that will harmonize assumptions and calculation methodologies between different modeling needs. This platform, built on top of the OpenStudio toolkit and EnergyPlus modeling engine, will underlie the Home Energy Score, Weatherization Assistant auditing software, and an Energy Rating Index calculation. 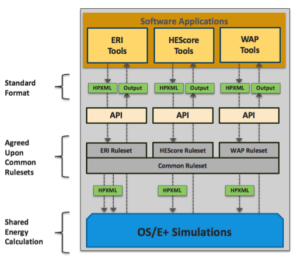 Combining these efforts will accelerate new technologies into software tools, increase consistency across DOE and industry programs, and lower industry-wide costs of maintaining multiple simulation engines. When we went to decide on a data model for the platform, HPXML was the obvious choice. As shown in the figure above, HPXML is the “glue” that connects every layer of the software stack. In the near future, thousands of homes will be modeled to help people make decisions about what home to buy—whether new or old—what to upgrade in their existing home, or how to most cost effectively help the nation’s poor be safe and comfortable in their homes. Those decisions will be made on the back of HPXML. As we are working towards this goal, there are plenty of bumps in the road. We are trying to use HPXML in ways beyond its initial intent. The HPXML Working Group has been an indispensable resource as we propose changes and work through problems of differing interpretations, data model ambiguity, and missing data elements in the standard. We have been able to collaborate with the group to augment HPXML and improve documentation to solve these problems. Many of these problems are not unique, and it has been useful to discuss with others who have dealt with similar shortcomings in the standard about how to make it better. Truly the value in HPXML isn’t in the xml schema documents but in the brain trust and consensus process of the stakeholders who continue to improve this living standard. I am excited, humbled, and sometimes surprised by the progress we’ve made and the traction HPXML has gained in the market. I see it as an important tool that is being and will be used to un-fracture the residential energy efficiency industry. There will always be different stakeholders with different motivations—whether that is a utility company looking to reduce their peak loads, a small software company making energy audit software, a contractor trying to close a sale, or a researcher trying to find ways to not have to rewrite code. Each can benefit from their tools being able to speak the same language. All will benefit, as we become more efficient at efficiency. Through the work of this industry, we can reduce the carbon footprint of our buildings. Noel Merket is a Research Engineer in the Buildings and Thermal Systems center at the National Renewable Energy Laboratory. He develops and maintains the HPXML data transfer standard and supports its adoption in the industry as co-chair of the HPXML working group. He also leads the development of residential building capabilities for the open source EnergyPlus building energy simulation software and develops data analysis and visualization tools for NREL's ResStock large-scale building stock simulation software.